$25 TOTES (That You Need For Yourself And Your Loved Ones)! 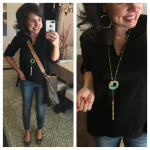 Today’s post has some great Fall outfits, and several items that I absolutely love…. but the star of the post is THIS TOTE. It’s regularly $58, and worth every penny at that price. But with the code TOTE2018, you can get this bag for $25. Which is an incredible deal! 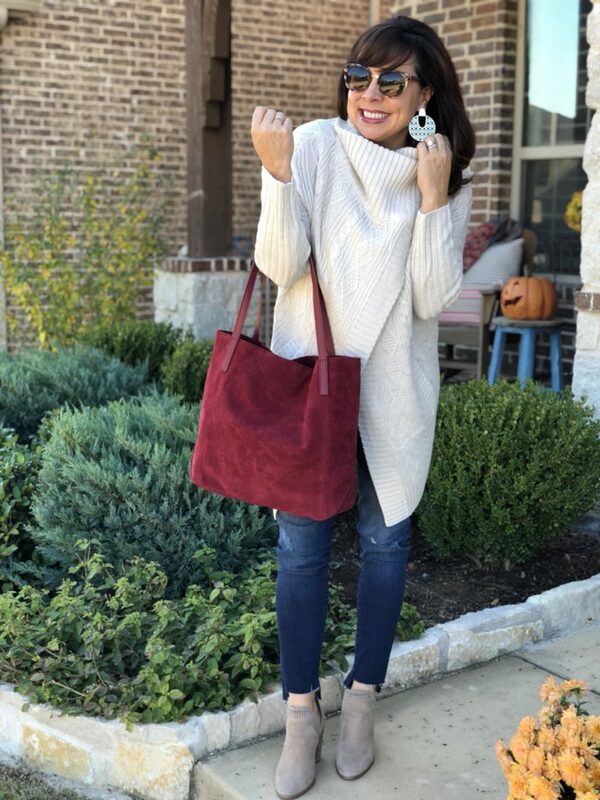 So, today I’m going to show you lots of great Fall outfits, while styling all 5 colors of the bag. Here’s what I’m thinking…. You’re probably going to need this bag for yourself (I mean, duh), but you’re definitely going to need it for Christmas gifts. How amazing would it be to hammer out 4 Christmas gifts for loved ones for $100?!? Or let’s be honest, maybe 3 for loved ones, and one for yourself as a reward for getting some Christmas shopping done early! 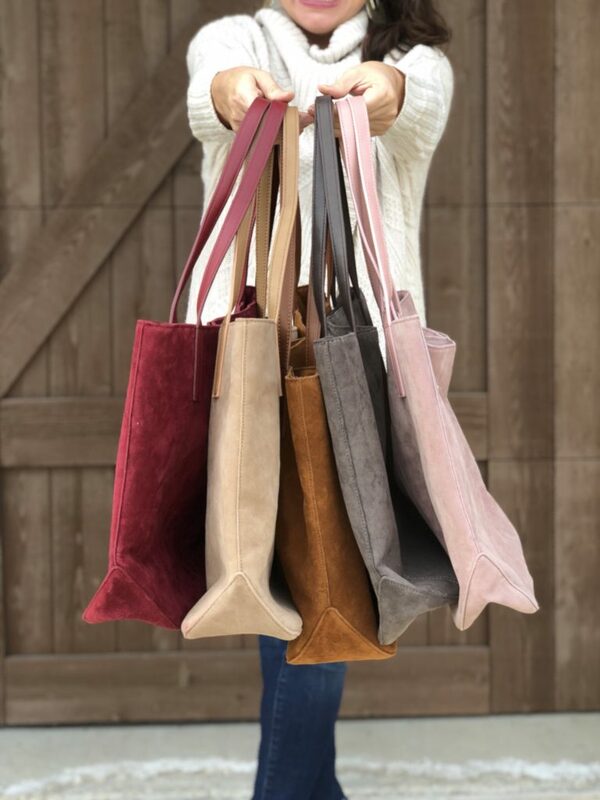 I love the idea of getting different girls in my family each a tote in a different color. 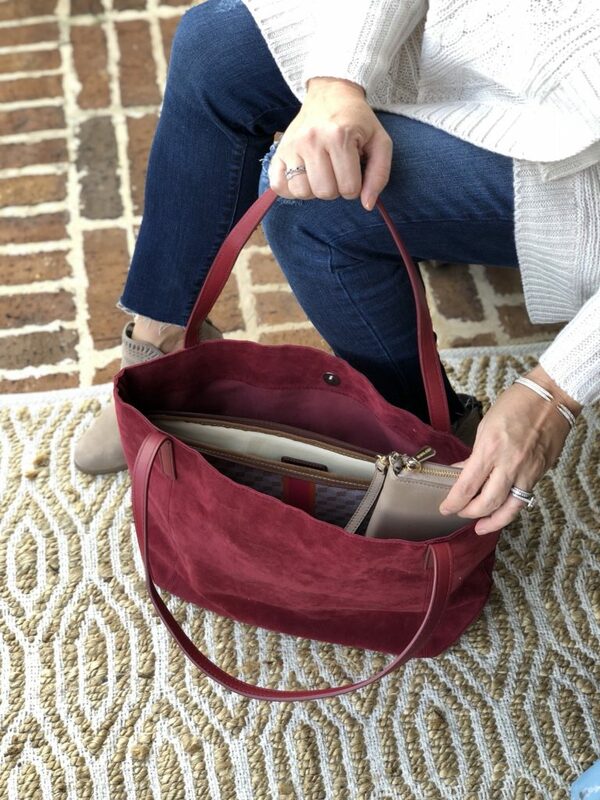 Let start out with the deep wine tote. I think this is going to be one of the most popular colors because the deep wine is so rich and pretty, and it really makes an outfit pop. I think it looks great with this cream cable cardi. 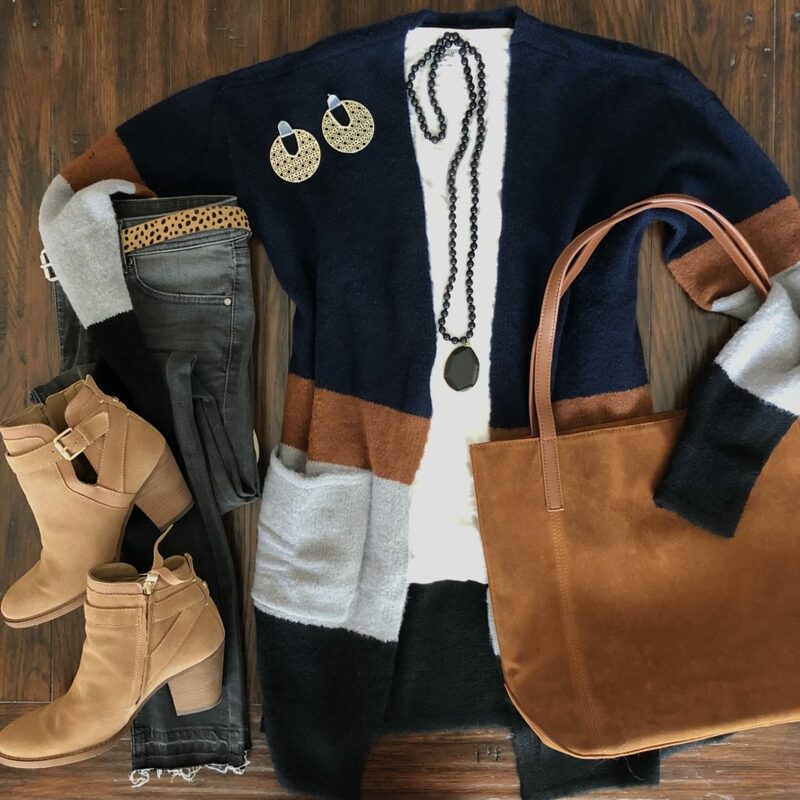 This cardi is so unique and fabulous. You can wear it snapped at the neck like this, or you can wear it unsnapped like a regular old cardi. I will definitely be wearing it both ways. For size reference, I’m wearing a small. It also comes in this great shitake color. It is unique and flattering with the fitted arms and the double v hemline. And the collar is so chic! I love it like this with jeans, but it will be long enough (for most) to wear it with a tunic tee and leggings. It would look great with my Spanx leather leggings! The tote is a great size: 17″ wide, 12″ high, and 5″ deep. It’s big enough to hold my laptop (my monogrammed laptop bag HERE), a make up bag (HERE), and my wallet. It fits a water bottle too, and you can see there’s still additional room. But don’t worry, it’s not too big either. It’s lined, and there are two open interior pockets and one zippered pocket as well. And it has a magnetic snap closure! Update with new information: I’ve had several readers ask if the totes stand up on their own, or if they slouch over. They totally stand up on their own! I’ll get some videos up on instagram stories at some point today, so check over there! I mean, Y’ALL! THIS IS A GREAT BAG! And here I am carrying the same color, but with my blush and wine side striped sweater. 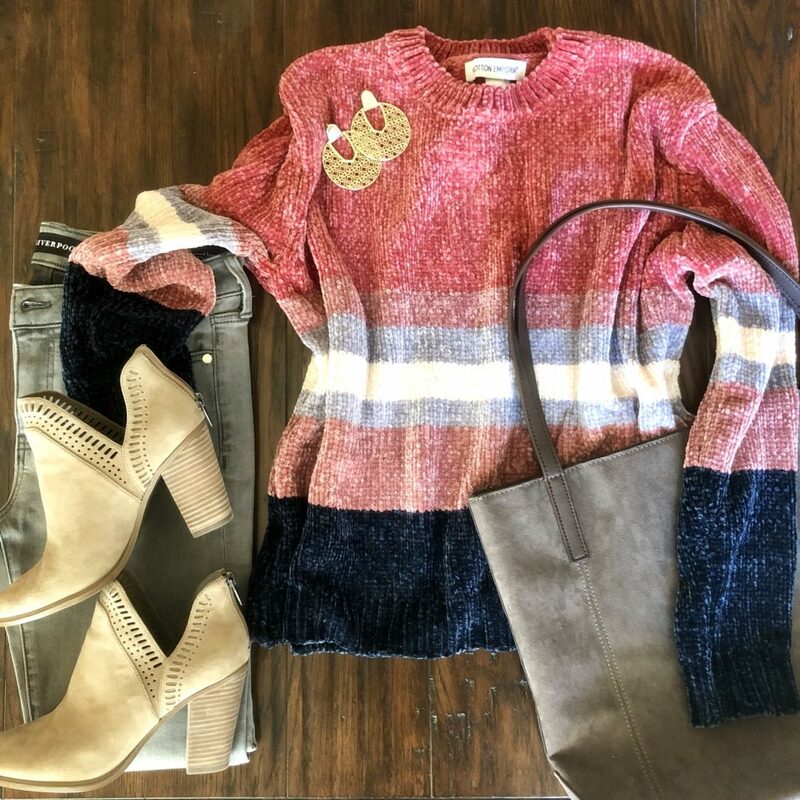 You’ve seen this sweater on several different occasions now (click HERE to see it with black jeans and click HERE to see it with grey jeans). It’s soft, can be dressed up or down, and I love the punch of style that the side stripe and split hem provides. For size reference, I’m wearing a small and it’s a relaxed fit. You might consider sizing down if you are between sizes or if you don’t need extra room in the chest. And let’s talk for a minute about the step hem jeans. LOOK HOW CUTE THE HEM IS! I’ve had this pair since August, and I’ve basically been rotating between them and this pair for the last couple of months when I need a pair of ankle jeans. I’m wearing my regular size 4s, but I would size down if between sizes. 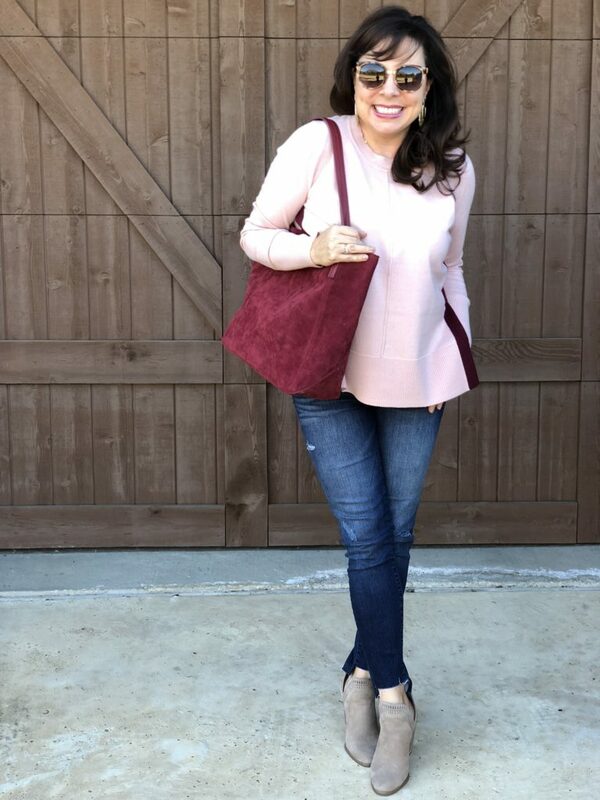 NOW I’M GOING TO SHOW YOU SOME OUTFITS AND STYLING IDEAS FOR ALL COLORS OF THE TOTE! 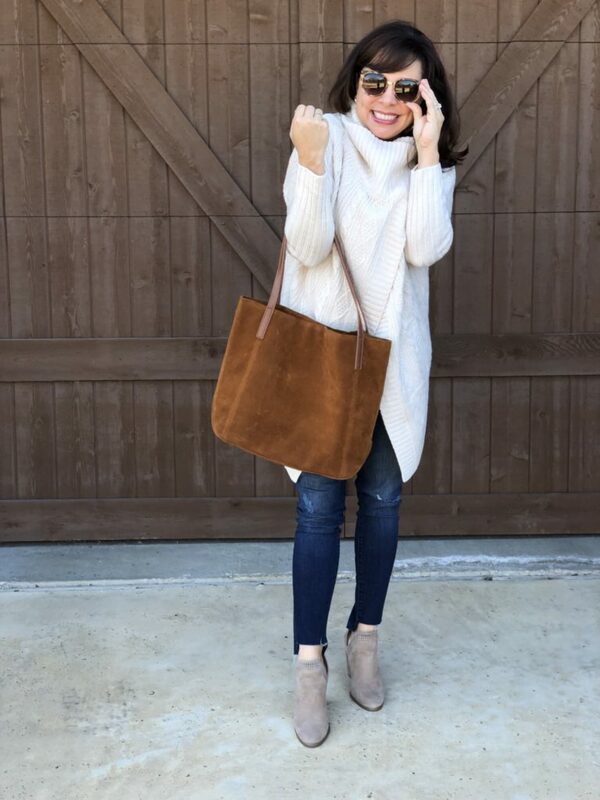 The cognac tote is classic and timeless, and the color will go with so many different outfits. 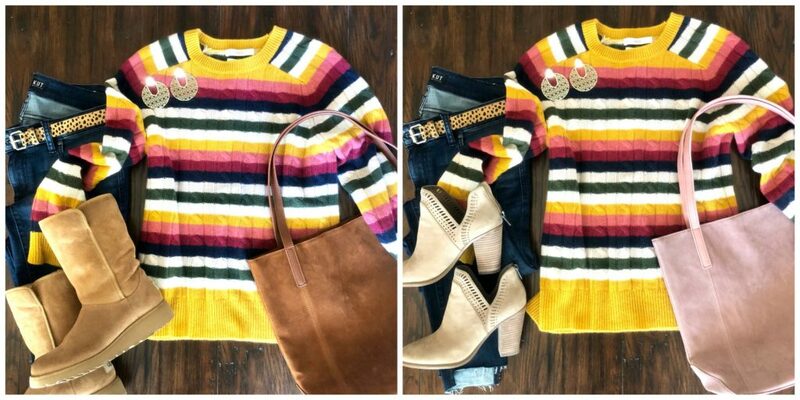 It pairs perfectly with this boyfriend cardi with the cognac stripe. (You can click HERE to see me wearing the cardi.) I love all the dark tones in this outfit. And now I’ve got some side by sides for you! 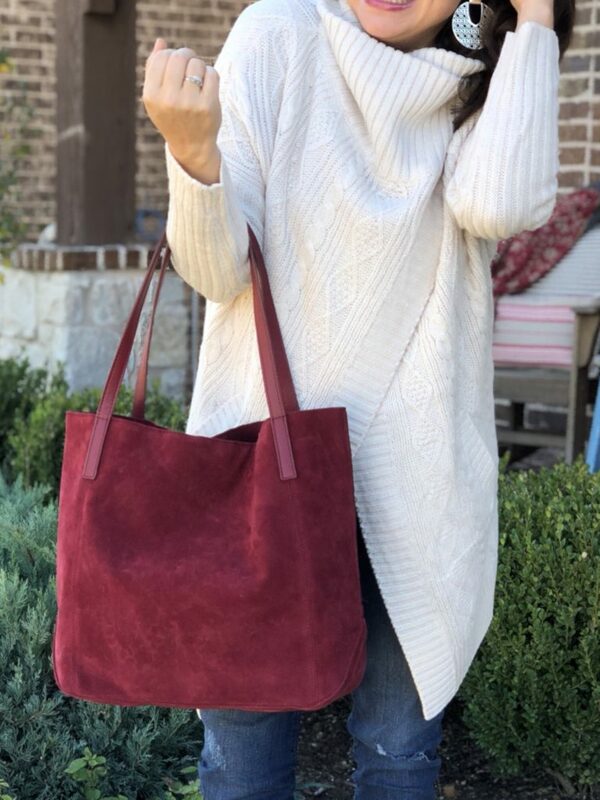 So you can not only get some great styling ideas, you can also see how the bag alone can change the look of the entire outfit. The sweater is new, so you haven’t seen it on me yet. I got it for New York to wear under my leather jacket. And you’ll never believe where the bright and cheery scarf is from! That’s the deep wine tote on the left and the putty on the right. And do you remember this striped sweater from my Shopping with Sheaffer post? Click HERE to see what it looks like on me. As you can see, it looks great with both the cognac and the blush. It would look pretty with the deep wine as well. And here’s the plaid tunic from the new Gibson x Living In Yellow collaboration. 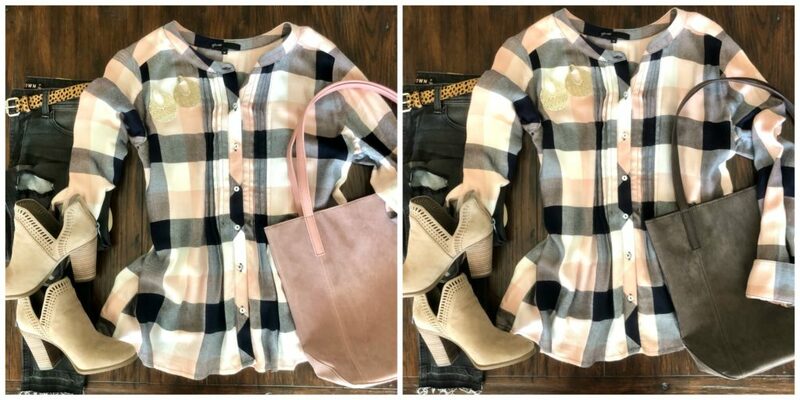 It looks great with grey jeans and both the blush and the grey tote. Click HERE to see it on me! And here’s the $45 chenille sweater from the Shopping with Sheaffer post. Click HERE to see the sweater on me. It’s crazy soft and so cute! I sized up to a medium for room in the chest, but stay with your regular size if you don’t need the extra room! And one more highlight of the cognac bag. 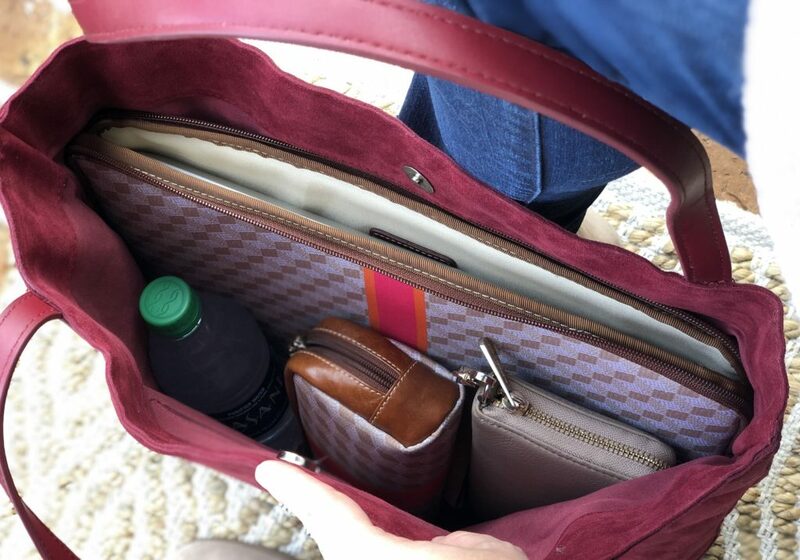 It’s the same outfit as the first one I showed today, but I switched out the deep wine tote for the cognac. See? Classic. And at $25, these would also make EXCELLENT gifts for teachers! 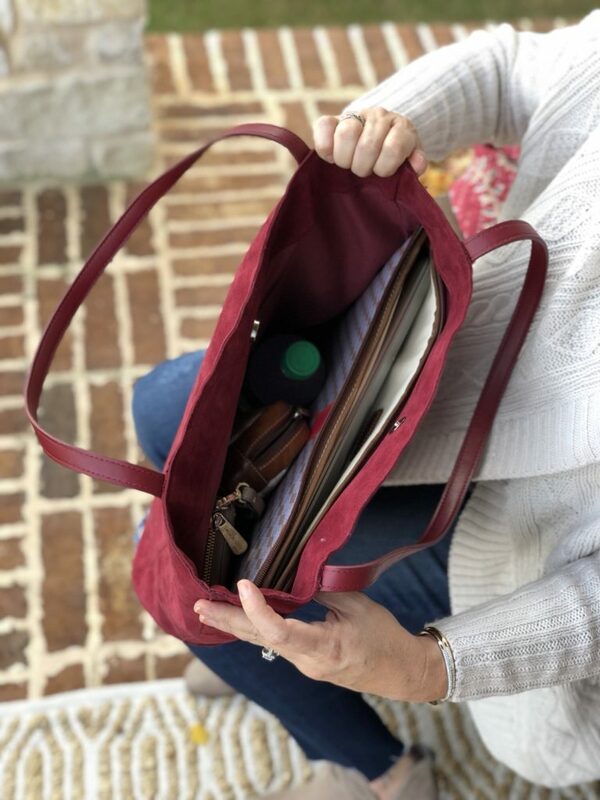 There’s plenty of room to carry papers to and from school! Get one for yourself, get one for your sister, get one for you daughter, get one for your kid’s teacher. You will be proud to give them, and the recipients will be THRILLED to receive them. And how great would it feel to cross some gifts off your list on November 2nd?!? 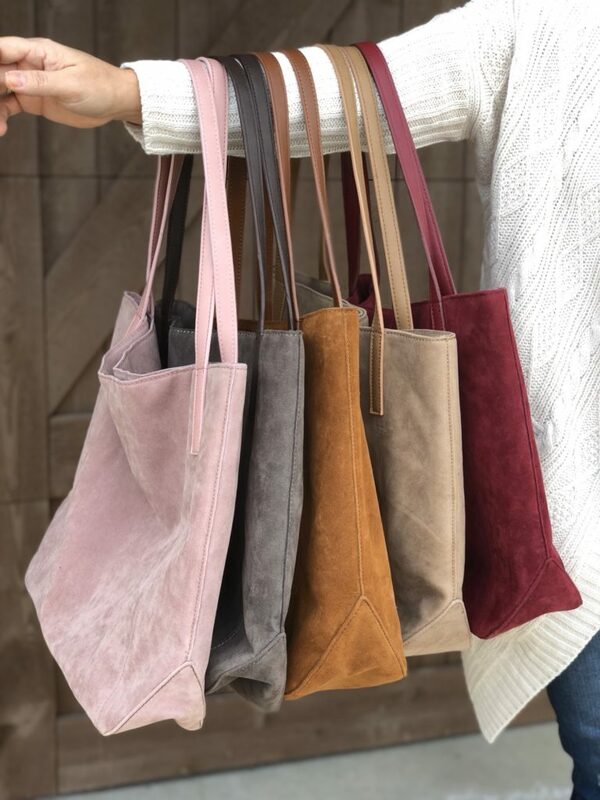 Remember, use the code TOTE2018 to get these fabulous bags for $25! REMEMBER: To get to the screen where you enter the code…put the bag(s) in your cart…..hit the green “check out” button….and then it will take you to a screen where you can enter the code! VERY IMPORTANT INFORMATION: The site lists the totes as “PRE-ORDER”, so please allow up to 2 weeks for the bags to ship. I’m updating this post, because due to an overwhelming response, ship time has increased to 2.5-3 weeks. I’m updating this post AGAIN, because due to an incredibly overwhelming response, ship time has increased to 3-3.5 weeks. They are making these bags as they are ordered (which enables them to give us such an incredible deal), but that comes with a longer ship time. If ordering as Christmas gifts, you will of course still have them in more than enough time. They’ll be worth it! I promise! A huge THANK YOU to Accessory Concierge for offering STMT readers this fantastic deal on these darling bags! 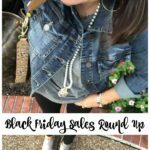 THE ABSOLUTE BEST BLACK FRIDAY DEALS! I can’t get over how cute and cozy you look in that ivory sweater!! Oh my stars! 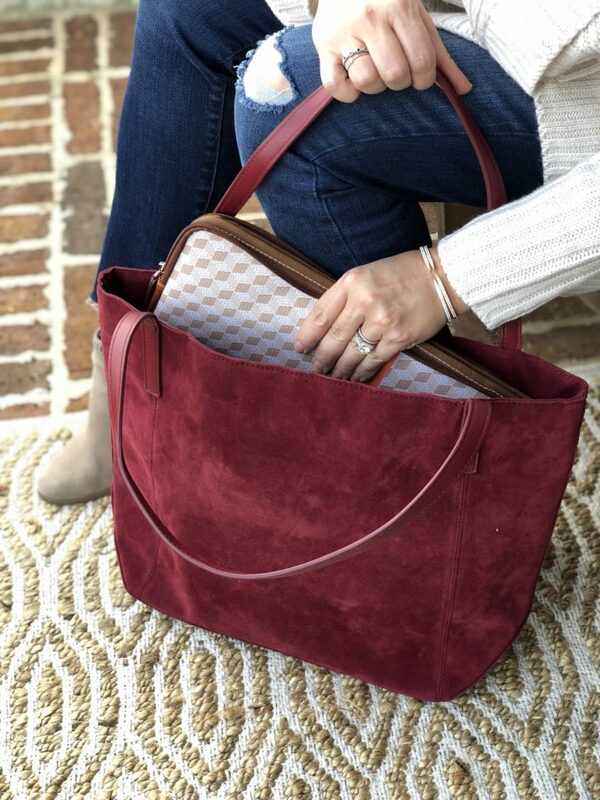 This bag is adorable, and I can’t believe it’s only $25! How fun! 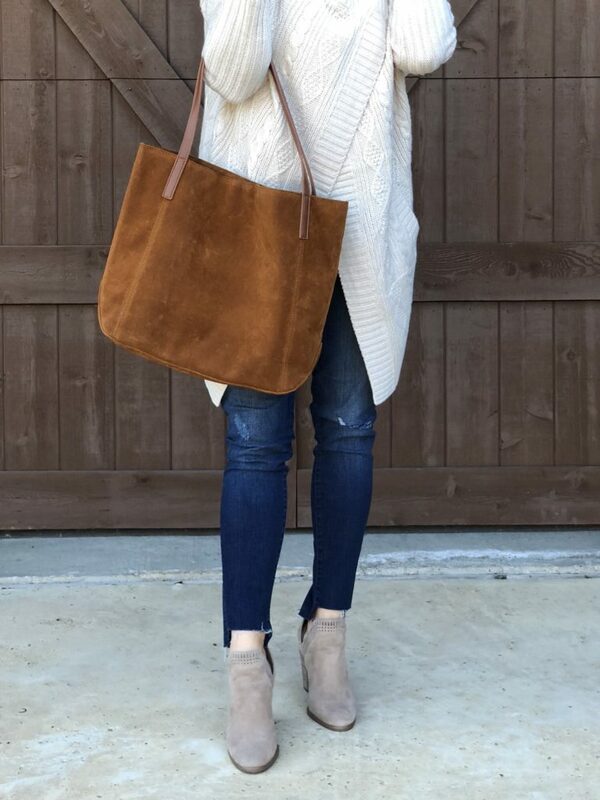 Okay, those totes are super, super cute…but that cream sweater is gorgeous too! Getting the red tote! What color would you suggest for teacher gifts? I want to order one of the totes for a trip on November 10th. Do you think they would be here in time? 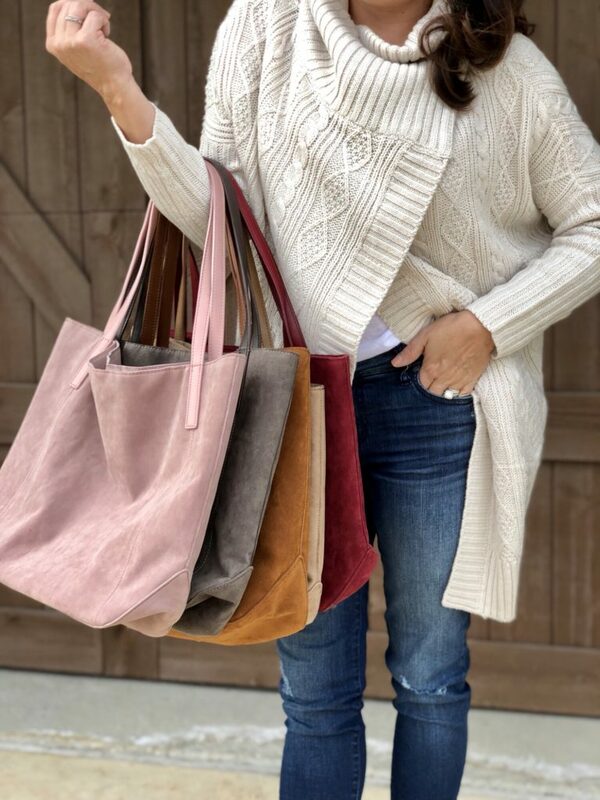 Hello – great tote – does it stand up by it self (basically hold it’s shape) or does it slouch down when not held up by the handles? Do the bags stand up at all, or fall over when you place them on the ground? Gorgeous ivory sweater! I just ordered FIVE of them!! What a great gift idea. Thanks for sharing Sheaffer. Victory is mine! Teacher gifts are always so difficult for me. We have so many teachers in the special ed department; different styles, and ages. I want to get something different that isn’t soap or hand sanitizer. But, it’s always the last minute thing I buy. Thank You!! Those bags are incredible!!!! Love all the colors and they look so expensive!!! The outfits are darling, too! I know I say this a lot, but you REALLY out did yourself!! 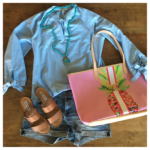 Love your blog and all the great shopping/holiday/outfit ideas you bring us. Keep ’em coming!! Happy Friday!! Love all these outfits! What size did you get in the trouve sweater? 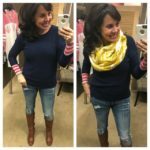 I’ve been looking for a great basic v neck sweater! It says it runs big so not sure if I should size down… Thanks Sheaffer! I would love to order but I have a question about the colors. On your site the blush looks more pink than on the A.C. site. The putty looks more putty on your site and more gray on A.C. What are the true colors? I love the looks of the bags. i could not see that there are 2 open pockets inside, in the picture it looks like big open space with zipper pocket. Yes! Thank you! Several Christmas gifts are now checked off my list! I got 4 of the totes! Just bought two totes, one in wine and grey! GREAT Christmas idea-thanks for the post! I will be making these bags mine. Thanks for sharing. Just bought 4! one is for me…shhhh! Hi! A couple of sweet young ladies in my life will be happy indeed come Christmas (especially when they open the totes and find a little something extra in them). Quick question, which photos show the tote colors more accurately – yours or the AC website? 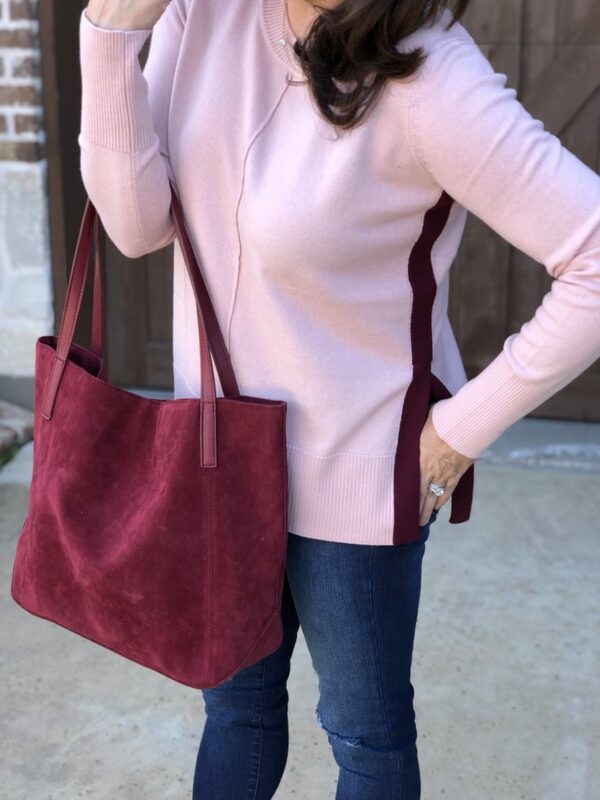 For example, the blush tote you’re holding seems more on the pink side; the one on the AC site looks blushier (if that’s a word? ); the others appear subtly different as well and this will determine which color I order for which person. Thanks! Wow, two presents crossed off the list (and of course I bought one for myself!) These look great and what a deal. Thank you so much! Just ordered a couple for my oldest daughter and my sister–these are perfect! I was on the fence until I saw today’s blogpost–they are just too cute and such a great value!